Have an Ice Cream Party! dessert. They really enjoyed creating their own Ice Cream snack! 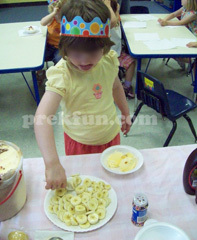 syrup, sprinkles, sliced bananas, and two different cones. Put first 3 ingredients into a small bag and close. Put ice into large bag until the bag is half full. and seal the large bag. Shake the bags for five (5) minutes. Put in freezer for a few minutes until thick like ice cream. Cut a lemon in half for each of the children. of lemon juice. Mix the lemon juice with water and sugar. Add ice. You need to add a little sugar to have good lemonade. or hammer. Pour flavoring over the crushed ice and eat with a spoon. Freeze water, juice, or kool - aid in different shaped containers. Unmold and enjoy the ice sculptures. Use a clear cup per child let them put a crushed vanilla wafer in the bottom and then add vanilla pudding. ~Freeze applesauce in popsicle molds. Ziploc bags for frozen yogurt on the go. Cut a hole in the end of the bag for easy access/eating. or worms before freezing for added fun. ~Freeze syrup from canned fruit. cream for added pizzazz. Then freeze in popsicle molds. in the jar and shake well. Pour into popsicle molds and freeze. or add more water, boil and make syrup. crushed cookies or sprinkles if desired. Pour into molds. Freeze several hours until firm. strawberries, raspberries or sliced bananas. Dip in chocolate if desired. Freeze on a tray. Once frozen, store in freezer bags. keep its consistency if kept frozen in a container. chunks (seeds removed), orange juice and water. Blend well. Then pour and freeze into molds. tablespoons sugar. Blend smooth. Pour into molds and freeze. Pre-K Fun Theme Pages are for educational reference only! I do not claim any of these as my own ideas. They are shared from friends and fellow group members. Thanks for sharing all your great ideas!